In the minds of many, the Sahara exists as a boundary between the Maghreb and “Black Africa”. History and our lived experience tell a different story. The latest issue of Chimurenga’s pan African gazette, the Chronic, bears testimony to this. 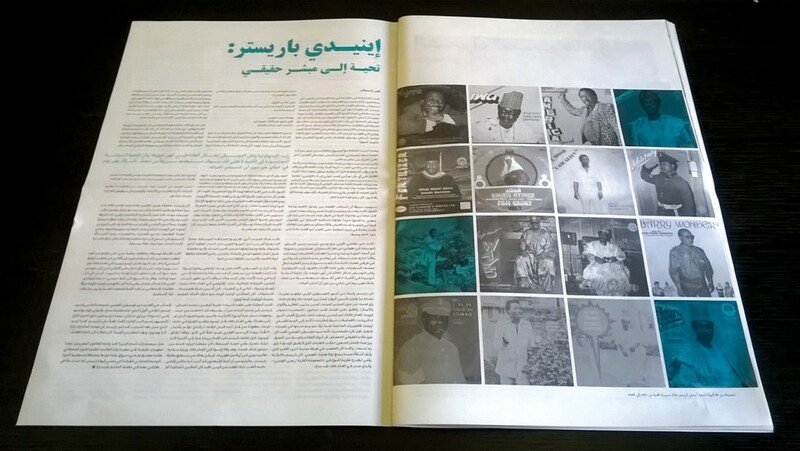 Designed in collaboration with Studio Safar in Beirut, and published in its entirety in Arabic as Muzmin, this special edition of the Chronic argues that the Sahara has never been a boundary, real or imagined. Trade caravans, intellectuals, literatures, human resources and political ideas have long circulated from Timbuktu to Marrakesh, from Khartoum to Tunis and Cairo and beyond. Marked by an urgency to unsettle the fictitious divide, this issue continues Chimurenga’s ongoing quest to present alternative political, economic, historical, geographical and cultural cartographies of the continent. To imagine Africa, and to speak of it, outside the maps drawn at the Berlin Conference (1884-85). Writing from Egypt, Helmi Sharawy remembers African liberation movements that had offices in Cairo during the time of President Gamal Abdul Nasser. Wendell Hassan Marsh follows the route from Françafrique, the shadowy network which remapped the continent along the lines of the French colonial empire, to Afrabia, a geo-political conflation, so named by Ali Mazrui, which imagines the whole of Africa and the whole of the Arab world as two regions in the process of merging into one. Dominique Malaquais and Cédric Vincent write the story of pan African cultural festivals staged on the continent soon after the colonial era – from PANAF 1969 in Algers to FESTAC ’77 in Lagos – as one of entanglement and a shared vision of an Africa yet to come. But, as Andrew Apter writes, divisive debates over the meanings and horizons of black cultural citizenship reigned in the background. Apter revisits the ideological fracas that arose between Leopold Sédar Senghor and Olusegun Obasanjo over “the Arab question” at FESTAC 77, while Sophia Azeb rejects the Poet-President’s dichotomy of Negritude/Arabicite. In an era where pan African literary prizes are seldom awarded to writers from North Africa, Ziad Bentahar wonders why the identities of “Arab” and “African” seem, from our contemporary vantage point, so distinct, as though a writer or scholar must choose one or the other. He talks to Marcia Lynx Qualey about history’s shifting boundaries and different ways of imagining connections between African literatures. 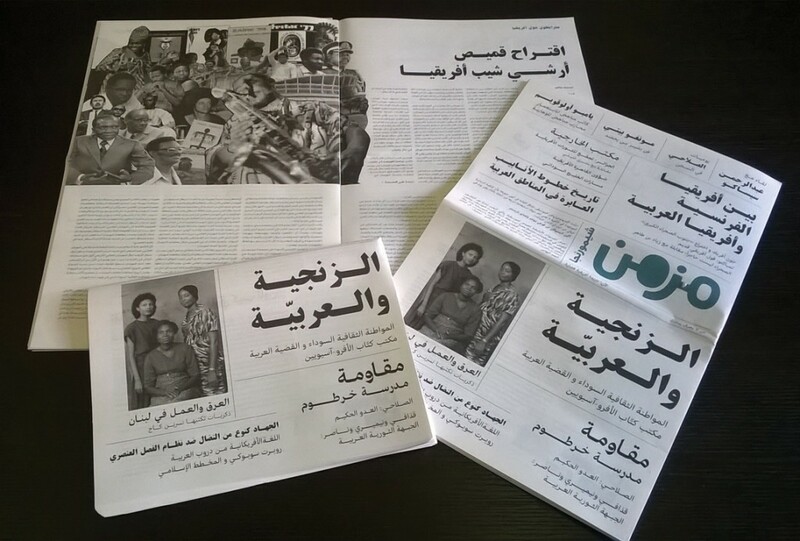 Meanwhile Akin Adesokan investigates how the Pan African Film and Television Festival of Ouagadougou (FESPACO) and the Carthage Film Festival (JCC) became exclusive platforms for North and sub Saharan cinemas. Going further back in time, Shamil Jeppie reads the Timbuktu manuscripts and considers the contemporary relevance of traditions of writing that pre-date the introduction of the printed book. Coming to South Africa, Saarah Jappie traces the Arabic roots of Afrikaans in Cape Town – a city where the contribution of Arabic in shaping political and cultural histories has almost been completely erased. And Achmad Cassiem highlights the role of Robert Sobukwe, founder of the Pan Africanist Congress, in triggering Muslim political radicalism during the struggle against apartheid. Other contributors in this issue include Jamal Mahjoub, Rayanne Tabet, Nisreen Kaj, Rasheed Araeen, Mongo Beti and more.